British based band Cymande were in so many ways pioneers. They all originated in various islands of the West Indies and were among the very earliest children to have been part of the the Windrush generation. They arrived in the UK to take in the vibrant jazz scene of the early to mid-1960s, were hearing the emergent sounds of reggae in ska and rock steady from their parents, and were witnessing across the pond the sounds of soul and funk. All these disparate elements played a crucial role in the development of the Cymande sound which was utterly unique for the UK in the early 1970s. Osibisa may have been pioneers of the Afro-Rock sound, but Cymande were different again. It would be several years before a younger generation of British born West Indians took on board the mid-1970s Roy Ayers and Donald Byrd and created a home brand hybrid of jazz-funk. Cymande preceded this and took on board Rastafarian nyabinghi drumming, funk guitar riffs and bass lines, jazzy reeds (Joe Harriott being a major influence) with freer elements also present. 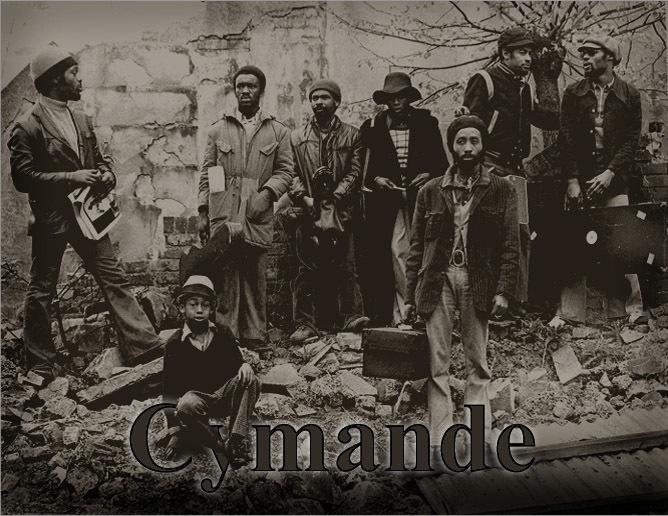 Pre-dating the disco era, Cymande enjoyed critical success first time round and crucially broke into the US market where African-American audiences immediately understood where the band were at. However, it would be the early 1980s before the New York hip-hop scene and DJs adopted some of Cymande’s riffs as key samples and among the DJs Kool Herc and Grand Master Flash were big fans. This interest was taken up by the rare groove scene in the UK in the late 1980s, most notably picking up on ‘Bra’ and ‘The Message’ from the first album, and suddenly original Cymnade vinyl albums attracted a good deal of attention and fetched large sums of money. By the late 1990s a re-issues programme of the first three albums was underway, but it has taken another decade for a more complete gathering of the classic Cymande period to feature on CD with properly annotated notes and extra tracks. For many the first album simply title ‘Cymande’ is the best and it would be hard to argue with a faultless set that covers so much terrain. It has been a long favourite of musicians such as Soul to Soul and MC Solaar and even film makers such as Spike Lee have used the music. If both ‘Bra’ and ‘The Message’ (featured here with two separate versions that include the 7″ mixes) were the key cuts, there were plenty of other interesting deeper numbers that reflect the esoteric musical interests of the band with ‘Zion I’ and ‘Rastafarian Folk Song’ highlighting their Caribbean roots. The second album, ‘Second Time Around’ from just a year later in 1973, builds on the achievements of the first and once again scored with a killer groove in ‘Fug’ which is a riff-laden instrumental ditty of distinction. The opener ‘Anthracite’ has something of an Afro-Beat feel to it, especially in the use of unison horns, and the extended flute solo simply adds to the listening pleasure. Nothing is obviously stated and one always has the feeling that there is a new experience just around the corner. If anything the third album, ‘Promised Heights’ is the most complete of all in that the group were far more confident about their musical prowess and were really starting to stretch out as evidenced on three tracks here which are over five minutes long. The single ‘Brothers on the slide’ is a much sought after 45 and in both the falsetto vocals and rapidity of the percussion echo the early 1970s sound of Curtis Mayfield. In contrast ‘The recluse’ is a moody number with trademark heavy bass and some intriguing blues guitar licks and extended saxophone solo. Indeed the instrumentals here are among the very strongest of all and even the gentle and deceptively simple starting ‘Changes’ adds on layers with some gorgeous flute and vocals that only kick in four and half minutes into the piece. Other funk elements are present on ‘Breezeman’ with rhythm guitar to the fore. Above all else, Cymande’s music does not pander to clichés and remains remarkably fresh, taking in myriad musical influences and yet still coming out with a coherent whole and that is some feat. Despite the arrival in 1981 of a fourth album, ‘Arrival’, this was a major departure from their previous three recordings and was in a smooth soul and disco vein. Fast forward to the present and Cymande in a slightly revised line-up have reformed and are just about to embark upon a major UK tour. This will be one of the year’s musical events not to be missed. In the meantime catch up with their rich back catalogued which has been expertly annotated here and includes a plethora of useful biographical information.